Returning to the Shark-Free Challenge after a brief hiatus was Aidan Coimin. Coimin entered the tournament as the top seed, but regulars Ellen Rosenfeld and Rory Dougall were not going to make that easy, as they are always dangerous. As fate would have it Dougall and Rosenfeld faced off in the first round, with Rosenfeld emerging victorious. 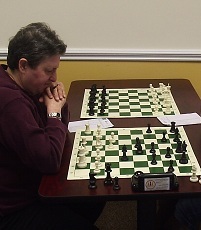 Next Coimin faced off against Dougall and after a long battle, he was able to convert the game in his favor. Finally, in the last round Coimin faced Rosenfeld. The two had a very long and entertaining game which could have gone either way. Finally, Coimin managed to win and thus the tournament victory was his with a perfect 3/3 score!